UBC Okanagan students become tomorrow’s leaders and professionals: scientists and athletes, artists and executives, teachers and engineers. Student awards help them to realize their dreams, contribute to society, and go out into the world equipped to make a difference. 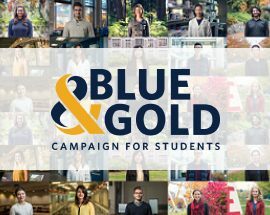 Whether they take the form of bursaries for those in financial need, athletics awards or scholarships for the most talented students, or fellowships for graduate students, individual and community support has never been more important. Many awards are established in honour or in memory of a family member, friend, or colleague, and can be a fitting way to recognize the accomplishments of someone who has touched your life. This is your chance to make a lasting impact that can change lives for the better.